Three Card Poker is highly recommended for players who are new to poker, as the rules are easy to pick up and it provides a great platform to start working on your poker strategy. Players play directly against the dealer instead of each other, making it the perfect social game to play. Another bonus is it has a relatively low house edge and is easy to find at online casinos. While all the casinos above have random number generated graphic-based versions of 3 Card Poker, our no.1 casino for this game is Guts Online Casino because it has a fantastic live dealer version of the game by Evolution Gaming. 1. Each player places a bet of either Ante or Pairs Plus, or both. 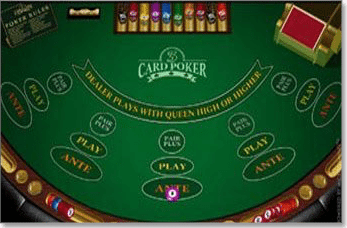 The Ante bet is played directly against the dealer’s hand, and Pairs Plus is completely separate and wagers on the hope of your hand consisting of a pair or better. 2. Once all bets are placed, the dealer shuffles and deals three face down cards to each player and themself. Players now examine their cards and the player closest to the dealer’s left starts the game. 3. If a player placed an Ante bet they now must decide to either fold or continue to play. Playing requires an additional wager of equal value to the initial Ante. Folding forfeits the original Ante wager. 4. Once the bets have been declared, the dealer’s hand is revealed. 5. The dealers hand must contain a Queen or higher. If this doesn’t happen, all players win even money for their Ante bet and return of their bet on the play. 6. If the dealers hand does contain a Queen or higher, a players hand needs to be better than the dealers hand to win. If the players hand is weaker than the dealer, they lose all wagers. If the players hand is stronger, they win even money on their Ante and play wagers. 7. Pairs Plus bets are played independently of the dealer’s hand. To win the Pairs Plus bet, a players hand simply needs to contain a pair or higher. 8. That concludes the round of three card poker and a new game can now be dealt. Three Card Poker is gaining popularity on the Internet and can now be found at many online casinos, including the ones in the above table. Playing online will also bring extras like better odds, higher payouts and fun side bets that you won’t find in a brick-and-mortar casino. If you’re new to any of these sites you can take advantage of welcome bonuses when signing up for an account. These generally take the form of free spins (sometimes with no deposit required) and matched deposit bonuses. Depending on which casino you are gambling at determines how big your deposit bonus is. Some casinos may give you up to $200 while others may match your initial deposit up to any amount. Generally the bonus amount is subject to wagering requirements, meaning you have to gamble the money a certain amount of times before you can withdraw it. In this poker variant, note that a Straight beats a Flush and Three of a Kind beats both. As mentioned earlier in this article, three card poker is a great game to get used to poker strategy before moving onto more complicated poker variants. While there is no genuine strategy that can beat the house advantage, players are advised to simply employ the strategy that provides the most enjoyment while not placing any wagers that will be detrimental to their own personal financial limitations. Always place an equal wager on both the Ante and Pairs Plus. This will bring you more chances of a win. Always play on a hand that consists of a Queen, Six, Four or higher. Never play on anything lower than a hand of this value otherwise the house edge increases from around 3.3% to around 7.65%. Of course this means that you will have to fold on several hands which requires patience, but is definitely better than continuing to place further play bets on hands you stand a low chance of winning. The pay scale for three card poker can vary. Avoid any games that offer a Pairs Plus payout of 3 to 1 for a Flush instead of the standard 4 to 1.